This is our 3-up tristar, sold manufacturer direct by Steve's LEDs, LLC for your specific application. It is a high quality solid aluminum MCPCB for superior thermal conductance to keep your LEDs cool. 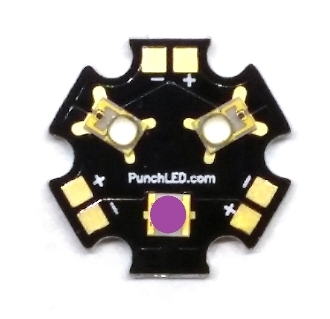 This is the ONLY star will allow you to have 2X Luxeon ES LEDs, your choice of color, and 1X Hyper Violet 3.0 on a single star, yet offers the flexibility of wiring each LED on a separate circuit. Universal Standard 20mm Star dimensions. The LED pricing INCLUDES the cost of custom mounting and reflowing. Upon special request, we will include up to 3, size 1206 jumpers, which allows partial series connections. Just want the bare empty star? Send us an email for excellent pricing -min order 20 pcs. Comes in 20 piece trays. Can be mounted using rivets, screws, or thermal adhesive.